September 21. 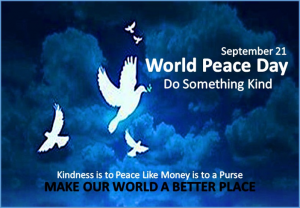 World Peace Day – Do Something Kind. Is sharing your love. Offering your kindness to the world. It’s as easy as finding a need and doing something to ease that need. Usually it is as simple as being aware of those around us and noticing how they are going because at times we all could do with a little assistance in doing whatever we might be doing but often too shy to ask for that help. Sometimes we all need a little help and could do with a helping hand. Doing Something Kind is generally about our giving to someone else. Mainly about giving of ourselves to offering a helpful hand to somebody else. It is in our generosity of spirit and in our own willingness to offer to other People our helpful hands, often as an unexpected surprise or in an out of the blue spontaneous moment, that our acts of loving kindness have their greatest impact and reward upon our world. 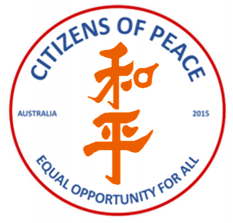 “The thing we need the most is each other” – Hugh Mackay.